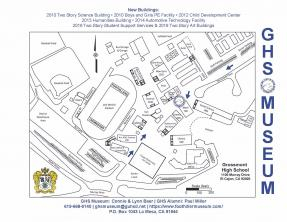 In October 2008, a dream was realized with the Grand Opening of the GHS Museum on the Grossmont campus. Prior to its opening, Connie Baer, Class of 1965, and Lynn Baer, Class of 1969, spent 18 months, organizing and creating the Museum displays. During the school year, the ninth grade English classes visit the Museum as part of our efforts to share our wonderful 98-year old history with them. We are open each Wednesday at lunch for the students to explore our amazing traditions. To learn more about the generosity of our Foothiller family, browse the 98th Anniversary Program HERE. For last year's donors, browse the 97th Anniversary Program HERE. 2016-2017 was our 96th Anniversary Celebration! Read more about the 96th Anniversary HERE, and browse our 95th Anniversary Program HERE. Foothillers have so much to celebrate! For memorabilia donors, please visit our Donors page. Open to the public the first Wednesday of each month and by appointment on other Wednesdays, the Museum welcomes alumni and the community to share their memories of Grossmont High, as we discover all that we have in common. 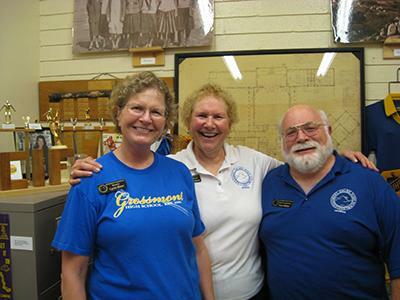 The Museum operates solely on donations, which are used to create the Museum displays, to preserve our memorabilia, and to celebrate Grossmont's history. Listed below are some of our current projects and fundraising needs. We hope to be in our new Museum location in the current 3300 sq. foot dance room, once the new Performing Arts complex is completed in 2020. Sponsorship Opportunities: We need your help! As we look ahead to moving into the 3,300 square foot dance room (Rec Room in 1950 Girls PE Building) in 2020, we need your financial donations to fund at least 10 new display cases, wall shelves, and mannequins! Donations of any amount are welcome. To make a donation, please donate via Pay Pal or write a check payable to GHS Educational Foundation and mail to GHS Museum, P.O. Box 1043, La Mesa, CA 91944. You can make a tax deductible donation to the GHS Museum via the PayPal link below! We know you are as eager as we are for this historic moment in Foothiller history. The celebration will begin with a Friday night football game, followed by a Saturday celebration, including the 2020 Hall of Honor induction ceremony and visits to the original restored 1922 Gray Castle and our expanded Museum in its permanent location. Please help us fund our newest history photo book (In the Campus History Series published by Arcadia Press) written by La Mesa historian Jim Newland, author of four local history books.